Saudi oil minister said on Tuesday it was too soon to say if OPEC and its allies would cut production as the terms of a deal remain unresolved, Bloomberg reported. Khalid Al-Falih’s comments come as OPEC and its allies are working towards a deal this week to reduce oil output by at least 1.3 million barrels per day, four sources told Reuters, adding that Russia’s resistance to a major cut was so far the main stumbling block. 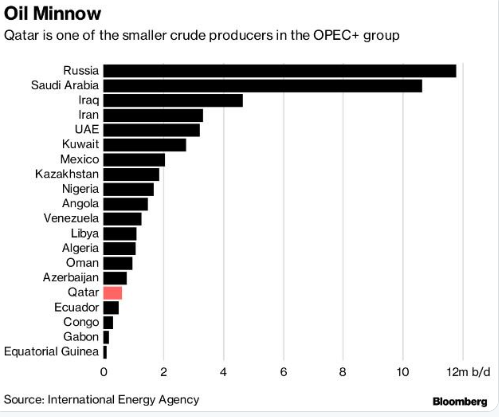 Al-Falih told Bloomberg that he saw an oversupplied market, but cautioned that all the members of the OPEC and allies group, needed to come together for a cut to go ahead. Someone said: "oil on the boil" after Russia and the Saudis agree to keep oil curbs into 2019.. Meanwhile, Qatar announced that it will leave the producer group from January to focus on its liquefied natural gas production. But. Qatar’s departure from the group will not have a significant impact on its production as it comprises just 2 percent of the total. It's a political, not economic decision.. Indeed, aggressive foreign policy pursued since the rise to power of MbS drove Qatar out. It's a significant, not just because of decision. It shows big frustration of small crude producers with the dominant role of Saudi Arabia in the oil block. Goodbye Qatar, who's next?